Locked yourself out of the UpdraftPlus settings page? Locked yourself out of the UpdraftPlus settings page? 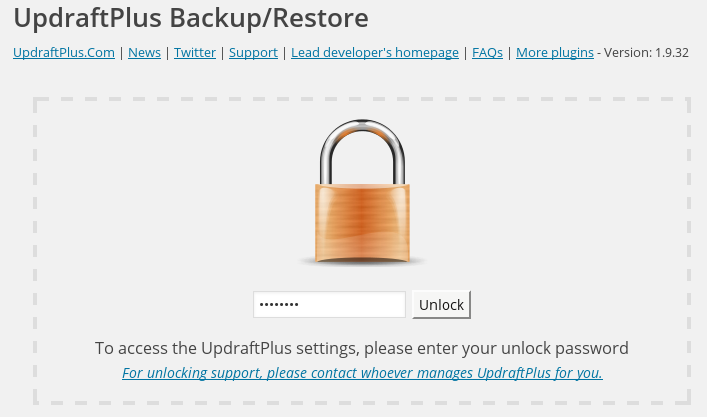 I have locked the UpdraftPlus settings page, and forgotten the password – how do I unlock it? Are you faced with this lock screen, and forgot the unlock password? The best thing to do is contact whoever set the lock password, and ask them! If you find the below steps too technical, then you can always purchase a one-time support incident from our shop. If you installed the “SQL Executioner” plugin, then you can access it in the Tools -> SQL Executioner menu. If you are not using SQL Executioner, but instead phpMyAdmin or some other SQL tool, then you will need to replace $ with the table prefix from your WordPress site – so, instead of $options, you’ll have something like wp_options (and something like wp_sitemeta instead of $sitemeta). (The tool should show you the names of all the tables, from which you can spot the correct table name; if not, then use the SQL command “SHOW TABLES;”). When you have successfully run the correct command, then the output should include the text password in it. On a single site, it should be obvious; on a multi-site, search in the output for the text updraft_adminlocking … and very shortly afterwards (a few characters later), you should be able to see the password. (Don’t directly edit it in your SQL editor unless you understand the format of PHP serialized arrays – otherwise you may lose some or all of your UpdraftPlus options). If you wish to reset your password again afterwards, then you can do so in the “Advanced Tools” (formerly “Debugging / Expert Tools”) tab of your UpdraftPlus settings page in the WordPress dashboard.